The Weather Girls (Music Downloads Not Rated by the ESRB) Join the movement and get the best dance music. Expand your track list to keep the dance party going! Download a free demo of "It's Raining Men" - The Weather Girls. Written by Paul Jabara and Paul Shaffer. Published by EMI Sosaha Music Inc (BMI), Postvalda Music (SESAC), Martin Bander Music (BMI), Charles Koppelman Music (BMI) and Jonathan Three Music (BMI). All rights on behalf Postvalda Music administered by W.B.M. Music Corp. All rights reserved. Used by permission. Courtesy of Sony Music Entertainment. By arrangement with Sony Music Entertainment Canada Inc.
Sorcerer (Music Downloads Not Rated by the ESRB) Join the movement and get the best dance music. Expand your track list to keep the dance party going! Download a free demo of "Dagomba" - Sorcerer. Composed by Tom Salta. Published by Ubisoft Music. Courtesy of Ubisoft Music. The World Cup Girls (Music Downloads Not Rated by the ESRB) Join the movement and get the best dance music. Expand your track list to keep the dance party going! Download "Futebol Crazy" - The World Cup Girls. Written by P. J. Borg. Published by West One APM. Courtesy of APM Music. The Weather Girls (Music Downloads Not Rated by the ESRB) Join the movement and get the best dance music. Expand your track list to keep the dance party going! Download "It's Raining Men" - The Weather Girls. Written by Paul Jabara and Paul Shaffer. Published by EMI Sosaha Music Inc (BMI), Postvalda Music (SESAC), Martin Bander Music (BMI), Charles Koppelman Music (BMI) and Jonathan Three Music (BMI). All rights on behalf Postvalda Music administered by W.B.M. Music Corp. All rights reserved. Used by permission. Courtesy of Sony Music Entertainment. By arrangement with Sony Music Entertainment Canada Inc.
Supergrass (Music Downloads Not Rated by the ESRB) Join the movement and get the best dance music. Expand your track list to keep the dance party going! Download "Alright" - Supergrass. Written by Daniel Goffey, Gareth Coombes and Michael Quinn. Published by EMI April Music Inc (ASCAP). All rights reserved. Used by permission. Courtesy of EMI Records Ltd. Under license from EMI Film & Television Music. Sorcerer (Music Downloads Not Rated by the ESRB) Join the movement and get the best dance music. Expand your track list to keep the dance party going! Download "Dagomba" - Sorcerer. Composed by Tom Salta. Published by Ubisoft Music. Courtesy of Ubisoft Music. The World Cup Girls (Music Downloads Not Rated by the ESRB) Join the movement and get the best dance music. Expand your track list to keep the dance party going! Download a free demo of "Futebol Crazy" - The World Cup Girls. Written by P. J. Borg. Published by West One APM. Courtesy of APM Music. Supergrass (Music Downloads Not Rated by the ESRB) Join the movement and get the best dance music. Expand your track list to keep the dance party going! Download a free demo of "Alright" - Supergrass. Written by Daniel Goffey, Gareth Coombes and Michael Quinn. Published by EMI April Music Inc (ASCAP). All rights reserved. Used by permission. Courtesy of EMI Records Ltd. Under license from EMI Film & Television Music. Gorillaz (Music Downloads Not Rated by the ESRB) Join the movement and get the best dance music. Expand your tracklist to keep the dance party going! Download a free demo of "Dare" - Gorillaz. Just Dance 3 and Kinect is required. Written by Damon Albarn, Jamie Hewlett and Brian Burton. © 2005 EMI Blackwood Music Inc. (BMI) / Chrysalis Music (ASCAP). All Rights Reserved. Used by Permission. Courtesy of EMI Records Ltd. Under license from EMI & Television Music. The Reverend Horatio Duncan & Amos Sweets (Music Downloads Not Rated by the ESRB) Join the movement and get the best dance music. Expand your track list to keep the dance party going! Download "Down By The Riverside" - The Reverend Horatio Duncan & Amos Sweets. Composed by The Reverend Horatio Duncan & Amos Sweets and The St. Bonaventura Voices of Salvation Gospel Choir. Published by Extreme Music Production USA. Courtesy of Extreme Music. Gorillaz (Music Downloads Not Rated by the ESRB) Join the movement and get the best dance music. Expand your track list to keep the dance party going! Download "Dare" - Gorillaz. Written by Damon Albarn, Jamie Hewlett and Brian Burton. © 2005 EMI Blackwood Music Inc. (BMI) / Chrysalis Music (ASCAP). All Rights Reserved. Used by Permission. Courtesy of EMI Records Ltd. Under license from EMI & Television Music. The Reverend Horatio Duncan & Amos Sweets (Music Downloads Not Rated by the ESRB) Join the movement and get the best dance music. Expand your track list to keep the dance party going! Download a free demo of "Down By The Riverside" - The Reverend Horatio Duncan & Amos Sweets. Composed by The Reverend Horatio Duncan & Amos Sweets and The St. Bonaventura Voices of Salvation Gospel Choir. Published by Extreme Music Production USA. Courtesy of Extreme Music. Nick Phoenix and Thomas Bergersen (Music Downloads Not Rated by the ESRB) Join the movement and get the best dance music. Expand your track list to keep the dance party going! Download "Professor Pumplestickle" - Nick Phoenix and Thomas Bergersen. Composed by Nick Phoenix and Thomas Bergersen. Published by Extreme Music Production USA. Courtesy of Extreme Music. Kim Wilde (Music Downloads Not Rated by the ESRB) Join the movement and get the best dance music. Expand your track list to keep the dance party going! Download "Kids in America" - Kim Wilde. Written by Marty Wilde and Ricky Wilde. Published by Finchley Music Corporation. Courtesy of EMI Records Ltd. Under license from EMI & Television Music. Nick Phoenix and Thomas Bergersen (Music Downloads Not Rated by the ESRB) Join the movement and get the best dance music. Expand your track list to keep the dance party going! Download a free demo of "Professeur Pumplestickle" - Nick Phoenix and Thomas Bergersen. Composed by Nick Phoenix and Thomas Bergersen. Published by Extreme Music Production USA. Courtesy of Extreme Music. Kim Wilde (Music Downloads Not Rated by the ESRB) Join the movement and get the best dance music. Expand your track list to keep the dance party going! Download a free demo of "Kids in America" - Kim Wilde. Written by Marty Wilde and Ricky Wilde. Published by Finchley Music Corporation. Courtesy of EMI Records Ltd. Under license from EMI & Television Music. KC and the Sunshine Band (Music Downloads Not Rated by the ESRB) Join the movement and get the best dance music. Expand your track list to keep the dance party going! Download a free demo of "That's the Way (I Like It)" - KC and the Sunshine Band. Written by Harry Wayne Casey and Richard Finch. Published by EMI Virgin Songs, Inc. d/b/a EMI Longitude Music (BMI). All Rights Reserved. Used by Permission. (P) 1975 T. K. Records a label of rhino Records Inc. Courtesy of Warner Music Canada Co.
Charleston (Music Downloads Not Rated by the ESRB) Join the movement and get the best dance music. Expand your track list to keep the dance party going! Download "Mugsy Baloney" - Charleston. Written by Gert Wilson. Published by Extreme Music Production USA. Courtesy of Extreme Music. Boney M. (Music Downloads Not Rated by the ESRB) Join the movement and get the best dance music. Expand your track list to keep the dance party going! Download "Rasputin" - Boney M. Written by Frank Farian, Fred Jay, George Reyam. Published by Far Musikverlag Gmbh & Co. Kg. Courtesy of Sony Music Entertainment Germany GmbH. By arrangement with Sony Music Entertainment Canada Inc.
KC and the Sunshine Band (Music Downloads Not Rated by the ESRB) Join the movement and get the best dance music. Expand your track list to keep the dance party going! Download "That's the Way (I Like It)" - KC and the Sunshine Band. Written by Harry Wayne Casey and Richard Finch. Published by EMI Virgin Songs, Inc. d/b/a EMI Longitude Music (BMI). All Rights Reserved. Used by Permission. (P) 1975 T. K. Records a label of rhino Records Inc. Courtesy of Warner Music Canada Co.
Boney M. (Music Downloads Not Rated by the ESRB) Join the movement and get the best dance music. Expand your track list to keep the dance party going! Download a free demo of "Rasputin" - Boney M. Written by Frank Farian, Fred Jay, George Reyam. Published by Far Musikverlag Gmbh & Co. Kg. Courtesy of Sony Music Entertainment Germany GmbH. By arrangement with Sony Music Entertainment Canada Inc.
Charleston (Music Downloads Not Rated by the ESRB) Join the movement and get the best dance music. Expand your track list to keep the dance party going! Download a free demo of "Mugsy Baloney" - Charleston. Written by Gert Wilson. Published by Extreme Music Production USA. Courtesy of Extreme Music. Snap! (Music Downloads Not Rated by the ESRB) Join the movement and get the best dance music. Expand your track list to keep the dance party going! Download "The Power" - Snap! Written by Benito Benites, John "Virgo" Garrett III and Antoinette Colandreo. Published by Hanseatic Musikverlag GmbH & Co KG (GEMA) / House Of Fun Music, Inc Courtesy of Luma Musikverwaltungs GmbH. Love Letter (Music Downloads Not Rated by the ESRB) Join the movement and get the best dance music. Expand your track list to keep the dance party going! Download a free demo of "Why Oh Why" - Love Letter. Written by S. Huguenin, C. Padovan and Y. Sanna. Published by Kosinus APM (ASCAP). Courtesy of APM Music. Bollywood (Music Downloads Not Rated by the ESRB) Join the movement and get the best dance music. Expand your track list to keep the dance party going! Download "Katti Kalandal" - Bollywood. Written by Veilumuth Chitralekha (NS) and Tony Tape (GEMA). Published by Sonoton APM (ASCAP) / Sonoton Music GMBH CO KG (GEMA). Courtesy of APM Music. Snap! (Music Downloads Not Rated by the ESRB) Join the movement and get the best dance music. Expand your track list to keep the dance party going! Download a free demo of "The Power" - Snap! Written by Benito Benites, John "Virgo" Garrett III and Antoinette Colandreo. Published by Hanseatic Musikverlag GmbH & Co KG (GEMA) / House Of Fun Music, Inc. (BMI). All rights on behalf of Hanseatic Musikverlag GmbH & Co KG administered by WB Music Corp. All rights reserved. Courtesy of Luma Musikverwaltungs GmbH. Sweat Invaders (Music Downloads Not Rated by the ESRB) Join the movement and get the best dance music. Expand your track list to keep the dance party going! Download a free demo of "Skin-To-Skin" - Sweat Invaders. Written by H. Langschwert. Published by Sonoton Music GMBH CO KG (GEMA) and Sonoton APM (ASCAP). Courtesy of APM Music. Love Letter (Music Downloads Not Rated by the ESRB) Join the movement and get the best dance music. Expand your track list to keep the dance party going! Download "Why Oh Why" - Love Letter. Written by S. Huguenin, C. Padovan and Y. Sanna. Published by Kosinus APM (ASCAP). Courtesy of APM Music. Sweat Invaders (Music Downloads Not Rated by the ESRB) Join the movement and get the best dance music. Expand your track list to keep the dance party going! Download "Skin-To-Skin" - Sweat Invaders. Written by H. Langschwert. Published by Sonoton Music GMBH CO KG (GEMA) and Sonoton APM (ASCAP). Courtesy of APM Music. Bollywood (Music Downloads Not Rated by the ESRB) Join the movement and get the best dance music. Expand your track list to keep the dance party going! Download a free demo of "Katti Kalandal" - Bollywood. Written by Veilumuth Chitralekha (NS) and Tony Tape (GEMA). Published by Sonoton APM (ASCAP) / Sonoton Music GMBH CO KG (GEMA). Courtesy of APM Music. Sweat Invaders (Music Downloads Not Rated by the ESRB) Join the movement and get the best dance music. Expand your track list to keep the dance party going! Download a free demo of "Boomsday" - Sweat Invaders. Written by Junkie XL. Published by The Extreme Music Library Ltd. Courtesy of Extreme Music. Sweat Invaders (Music Downloads Not Rated by the ESRB) Join the movement and get the best dance music. Expand your track list to keep the dance party going! Download "Merengue" - Sweat Invaders. Written by Chucho Merchan. Published by The Extreme Music Library Ltd. Courtesy of Extreme Music. Sweat Invaders (Music Downloads Not Rated by the ESRB) Join the movement and get the best dance music. Expand your track list to keep the dance party going! Download a free demo of "Merengue" - Sweat Invaders. Written by Chucho Merchan. Published by The Extreme Music Library Ltd. Courtesy of Extreme Music. Sweat Invaders (Music Downloads Not Rated by the ESRB) Join the movement and get the best dance music. Expand your track list to keep the dance party going! Download a free demo of "Cardiac Caress" - Sweat Invaders. Written by Richardson, Ford and Macklin. Published by The Extreme Music Library Ltd. Courtesy of Extreme Music. Baha Men (Music Downloads Not Rated by the ESRB) Join the movement and get the best dance music. Expand your track list to keep the dance party going! Download "Who Let the Dogs Out?" - Baha Men. Written by Anslem Douglas. Published by Crosstown. Administered by Kobalt Music Publishing America, Inc. Courtesy of Virgin Records Inc. Under license from EMI & Television Music. Sweat Invaders (Music Downloads Not Rated by the ESRB) Join the movement and get the best dance music. Expand your track list to keep the dance party going! Download "Cardiac Caress" - Sweat Invaders. Written by Richardson, Ford and Macklin. Published by The Extreme Music Library Ltd. Courtesy of Extreme Music. Sweat Invaders (Music Downloads Not Rated by the ESRB) Join the movement and get the best dance music. Expand your track list to keep the dance party going! Download "Boomsday" - Sweat Invaders. Written by Junkie XL. Published by The Extreme Music Library Ltd. Courtesy of Extreme Music. Baha Men (Music Downloads Not Rated by the ESRB) Join the movement and get the best dance music. Expand your track list to keep the dance party going! Download a free demo of "Who Let the Dogs Out?" - Baha Men. Written by Anslem Douglas. Published by Crosstown. Administered by Kobalt Music Publishing America, Inc. Courtesy of Virgin Records Inc. Under license from EMI & Television Music. Sweat Invaders (Music Downloads Not Rated by the ESRB) Join the movement and get the best dance music. Expand your track list to keep the dance party going! Download a free demo of "Touch Me Want Me" - Sweat Invaders. Written by Chunky Nelson (PRS). Published by Carbert Special Accounts (BMI) APM. Courtesy of APM Music. Reel 2 Real feat. The Mad Stuntman (Music Downloads Not Rated by the ESRB) Join the movement and get the best dance music. Expand your track list to keep the dance party going! Download a free demo of "I Like to Move It (Radio Mix)" - Reel 2 Real feat. The Mad Stuntman. Written by E. Morillo and M. Quashie. Published by Strictly Rhythm Publishing (ASCAP), Mega Platinum Music (ASCAP). (P) 1993 Strictly Rhythm Records, Inc. © 2006 Strictly Rhythm Records, Inc. Courtesy of Strictly Rhythm Records and Shelly Bay. Reel 2 Real feat. The Mad Stuntman (Music Downloads Not Rated by the ESRB) Join the movement and get the best dance music. Expand your track list to keep the dance party going! Download "I Like to Move It (Radio Mix)" - Reel 2 Real feat. The Mad Stuntman. Written by E. Morillo and M. Quashie. Published by Strictly Rhythm Publishing (ASCAP), Mega Platinum Music (ASCAP). (P) 1993 Strictly Rhythm Records, Inc. © 2006 Strictly Rhythm Records, Inc. Courtesy of Strictly Rhythm Records and Shelly Bay. Sweat Invaders (Music Downloads Not Rated by the ESRB) Join the movement and get the best dance music. Expand your track list to keep the dance party going! Download a free demo of "Dun N Dusted" - Sweat Invaders. Written by Jason Creasey. Published by The Extreme Music Library Ltd. Courtesy of Extreme Music. Sweat Invaders (Music Downloads Not Rated by the ESRB) Join the movement and get the best dance music. Expand your track list to keep the dance party going! Download "Beat Match Until I'm Blue" - Sweat Invaders. Written by Alan Hawkshaw (PRS) and Andrew Kingslow (PRS). Published by KPM APM (ASCAP). Courtesy of KPM APM. Sweat Invaders (Music Downloads Not Rated by the ESRB) Join the movement and get the best dance music. Expand your track list to keep the dance party going! Download a free demo of "Beat Match Until I’m Blue" - Sweat Invaders. Written by Alan Hawkshaw (PRS) and Andrew Kingslow (PRS). Published by KPM APM (ASCAP). Courtesy of KPM APM. Sweat Invaders (Music Downloads Not Rated by the ESRB) Join the movement and get the best dance music. Expand your track list to keep the dance party going! Download "Dun N Dusted" - Sweat Invaders. Written by Jason Creasey. Published by The Extreme Music Library Ltd. Courtesy of Extreme Music. Sweat Invaders (Music Downloads Not Rated by the ESRB) Join the movement and get the best dance music. Expand your track list to keep the dance party going! Download "Touch Me Want Me" - Sweat Invaders. Written by Chunky Nelson (PRS). Published by Carbert Special Accounts (BMI) APM. Courtesy of APM Music. The B-52s (Music Downloads Not Rated by the ESRB) Join the movement and get the best dance music. Expand your track list to keep the dance party going! Download a free demo of "Funplex (CSS Remix)" - The B-52s. Written by Fred Schneider, Kate Pierson, Keith Strickland and Cindy Wilson. Published by EMI April Music Inc. (ASCAP). All Rights Reserved. Used by Permission. Courtesy of Man-Woman Together, Now!, Inc. under exclusive license to Astralwerks. Under license from EMI & Television Music. Iggy Pop (Music Downloads Not Rated by the ESRB) Join the movement and get the best dance music. Expand your track list to keep the dance party going! Download a free demo of "Louie Louie" - Iggy Pop. Written by Richard Berry. Published by EMI Virgin Songs, Inc. d/b/a EMI Longitude Music (BMI). All Rights Reserved. Used by Permission. Courtesy of Virgin Records Inc. Under license from EMI & Television Music. New Kids On The Block (Music Downloads Not Rated by the ESRB) Join the movement and get the best dance music. Expand your track list to keep the dance party going! Download a free demo of "Step by Step" - New Kids On The Block. Written by Larry Curtis Johnson. Published by EMI April Music Inc. (ASCAP). All Rights Reserved. Used by Permission. Courtesy of Sony Music Entertainment. By arrangement with Sony Music Entertainment Canada Inc.
Iggy Pop (Music Downloads Not Rated by the ESRB) Join the movement and get the best dance music. Expand your track list to keep the dance party going! Download "Louie Louie" - Iggy Pop. Written by Richard Berry. Published by EMI Virgin Songs, Inc. d/b/a EMI Longitude Music (BMI). All Rights Reserved. Used by Permission. Courtesy of Virgin Records Inc. Under license from EMI & Television Music. Santa Clones (Music Downloads Not Rated by the ESRB) Join the movement and get the best dance music. Expand your track list to keep the dance party going! Download "Crazy Christmas" - Santa Clones. Contains samples of “Jingle Bells 2” by O. Sieben and J. Pierpont, “O Christmas Surf” by R. Abernethy, “We Wish U A Merry Skaristmas” by D. Martin, “Country Bells” by R. Vilas and “We Wish You An Indie Christmas” by Backer, Taylor and Emanuel. Courtesy of APM Music and Extreme Music. Santa Clones (Music Downloads Not Rated by the ESRB) Join the movement and get the best dance music. Expand your track list to keep the dance party going! Download a free demo of "Crazy Christmas" - Santa Clones. Contains samples of “Jingle Bells 2” by O. Sieben and J. Pierpont, “O Christmas Surf” by R. Abernethy, “We Wish U A Merry Skaristmas” by D. Martin, “Country Bells” by R. Vilas and “We Wish You An Indie Christmas” by Backer, Taylor and Emanuel. Courtesy of APM Music and Extreme Music. New Kids On The Block (Music Downloads Not Rated by the ESRB) Join the movement and get the best dance music. Expand your track list to keep the dance party going! Download "Step by Step" - New Kids On The Block. Written by Larry Curtis Johnson. Published by EMI April Music Inc. (ASCAP). All Rights Reserved. Used by Permission. Courtesy of Sony Music Entertainment. By arrangement with Sony Music Entertainment Canada Inc. The B-52s (Music Downloads Not Rated by the ESRB) Join the movement and get the best dance music. Expand your track list to keep the dance party going! Download "Funplex (CSS Remix)" - The B-52s. Written by Fred Schneider, Kate Pierson, Keith Strickland and Cindy Wilson. Published by EMI April Music Inc. (ASCAP). All Rights Reserved. Used by Permission. Courtesy of Man-Woman Together, Now!, Inc. under exclusive license to Astralwerks. Under license from EMI & Television Music. Dee Dee Sharp (Music Downloads Not Rated by the ESRB) Join the movement and get the best dance music. Expand your track list to keep the dance party going! Download "Mashed Potato Time" - Dee Dee Sharp. Written by Robert Bateman, Kalman Cohen, William Garrett, Brian Holland, Freddie Gorman and Georgia Dobbins. Published by EMI Blackwood Music Inc. (BMI), Jobete Music Co., Inc. (ASCAP) and Stone Agate Music (A Division of Jobete Music Co., Inc.) (BMI). All Rights Reserved. Used by Permission. Courtesy of ABCKO Music & Records, Inc.
Dee Dee Sharp (Music Downloads Not Rated by the ESRB) Join the movement and get the best dance music. Expand your track list to keep the dance party going! Download a free demo of "Mashed Potato Time" - Dee Dee Sharp. Written by Robert Bateman, Kalman Cohen, William Garrett, Brian Holland, Freddie Gorman and Georgia Dobbins. Published by EMI Blackwood Music Inc. (BMI), Jobete Music Co., Inc. (ASCAP) and Stone Agate Music (A Division of Jobete Music Co., Inc.) (BMI). All Rights Reserved. Used by Permission. Courtesy of ABCKO Music & Records, Inc.
Mardi Gras (Music Downloads Not Rated by the ESRB) Join the movement and get the best dance music. Expand your track list to keep the dance party going! Download "Iko Iko" - Mardi Gras. Written by James Crawford, Barbara Hawkins, Rosa Hawkins and Joan Johnson. Published by EMI Virgin Songs, Inc d/b/a EMI Longitude Music (BMI), Songs Of Windswept Pacific. All rights reserved. Used by permission. Courtesy of Music Factory Entertainment Group Ltd.
Bangles (Music Downloads Not Rated by the ESRB) Join the movement and get the best dance music. Expand your track list to keep the dance party going! Download "Walk Like an Egyptian" - Bangles. Written by Liam Sternberg. Published by Peer International Corporation. Courtesy of Sony Music Entertainment. By arrangement with Sony Music Entertainment Canada Inc.
Reggaeton (Music Downloads Not Rated by the ESRB) Join the movement and get the best dance music. Expand your track list to keep the dance party going! Download "Baby Girl" - Reggaeton. Written by Joachim Svare (ASCAP) and Carsten Lindberg (BMI). Published by Ded Good APM (ASCAP). Courtesy of APM Music. Mardi Gras (Music Downloads Not Rated by the ESRB) Join the movement and get the best dance music. Expand your track list to keep the dance party going! Download a free demo of "Iko Iko" - Mardi Gras. Written by James Crawford, Barbara Hawkins, Rosa Hawkins and Joan Johnson. Published by EMI Virgin Songs, Inc d/b/a EMI Longitude Music (BMI), Songs Of Windswept Pacific. All rights reserved. Used by permission. Courtesy of Music Factory Entertainment Group Ltd.
Bangles (Music Downloads Not Rated by the ESRB) Join the movement and get the best dance music. Expand your track list to keep the dance party going! Download a free demo of "Walk Like an Egyptian" - Bangles. Written by Liam Sternberg. Published by Peer International Corporation. Courtesy of Sony Music Entertainment. By arrangement with Sony Music Entertainment Canada Inc.
Reggaeton (Music Downloads Not Rated by the ESRB) Join the movement and get the best dance music. Expand your track list to keep the dance party going! Download a free demo of "Baby Girl" - Reggaeton. Written by Joachim Svare (ASCAP) and Carsten Lindberg (BMI). Published by Ded Good APM (ASCAP). Courtesy of APM Music. The Hit Crew (Music Downloads Not Rated by the ESRB) Join the movement and get the best dance music. Expand your track list to keep the dance party going! Download "Toxic" - The Hit Crew Written by Cathy Dennis, Christian Karlsson, Henrik Jonback and Pontus Winnberg. Published by BMG Gold Songs (ASCAP) o/b/o Murlyn Songs AB (ASCAP) administered by BMG Rights Management (US) LLC / Colgems All rights reserved. Used by permission. Courtesy of Turn Up The Music Licensing. By arrangement with The Orchard. Calvin Harris (Music Downloads Not Rated by the ESRB) Join the movement and get the best dance music. Expand your track list to keep the dance party going! Download a free demo of "Acceptable in the 80's" - Calvin Harris. Written by Adam Wiles. Published by EMI April Music Inc. (ASCAP). All Rights Reserved. Used by Permission. Courtesy of Sony Music Entertainment UK Limited. By arrangement with Sony Music Entertainment Canada Inc. Studio Allstars (Music Downloads Not Rated by the ESRB) Join the movement and get the best dance music. Expand your track list to keep the dance party going! Download a free demo of "Jump" - Studio Allstars. Written by Deke Richards, Alphonso Mizell, Freddie Perren, Berry Gordy Jr., Jermaine Dupri, Marshall Jones, Leroy Bonner, Clarence Satchell, Norman Napier, Andrew Noland, Marvin Pierce, Gregory Webster, Walter Morrison and Ralph Middlebrooks. Published by Bridgeport Music Inc. (BMI), EMI April Music Inc (ASCAP) and Jobete Music Co. Inc (ASCAP). All rights reserved. Used by permission. Courtesy of One Media Publishing Ltd. By arrangement with The Orchard. Ike & Tina Turner (Music Downloads Not Rated by the ESRB) Join the movement and get the best dance music. Expand your track list to keep the dance party going! Download "Proud Mary" - Ike & Tina Turner. Written by John. C. Fogerty. Published by Jondora Music (BMI). Used by permission of Concord Music Group, Inc. Courtesy of Capitol Records LLC. Under license from EMI Film & Television Music. The Hit Crew (Music Downloads Not Rated by the ESRB) Join the movement and get the best dance music. Expand your track list to keep the dance party going! Download a free demo of "Toxic" - The Hit Crew. Written by Cathy Dennis, Christian Karlsson, Henrik Jonback and Pontus Winnberg. Published by BMG Gold Songs (ASCAP) o/b/o Murlyn Songs AB (ASCAP) administered by BMG Rights Management (US) LLC / Colgems All rights reserved. Used by permission. Courtesy of Turn Up The Music Licensing. By arrangement with The Orchard. Studio Allstars (Music Downloads Not Rated by the ESRB) Join the movement and get the best dance music. Expand your track list to keep the dance party going! Download "Jump" - Studio Allstars. Written by Deke Richards, Alphonso Mizell, Freddie Perren, Berry Gordy Jr., Jermaine Dupri, Marshall Jones, Leroy Bonner, Clarence Satchell, Norman Napier, Andrew Noland, Marvin Pierce, Gregory Webster, Walter Morrison and Ralph Middlebrooks. Published by Bridgeport Music Inc. (BMI), EMI April Music Inc (ASCAP) and Jobete Music Co. Inc (ASCAP). All rights reserved. Used by permission. Courtesy of One Media Publishing Ltd. By arrangement with The Orchard. Ike & Tina Turner (Music Downloads Not Rated by the ESRB) Join the movement and get the best dance music. Expand your track list to keep the dance party going! Download a free demo of "Proud Mary" - Ike & Tina Turner. Written by John. C. Fogerty. Published by Jondora Music (BMI). Used by permission of Concord Music Group, Inc. Courtesy of Capitol Records LLC. Under license from EMI Film & Television Music. Calvin Harris (Music Downloads Not Rated by the ESRB) Join the movement and get the best dance music. Expand your track list to keep the dance party going! Download "Acceptable in the 80's" - Calvin Harris. Written by Adam Wiles. Published by EMI April Music Inc. (ASCAP). All Rights Reserved. Used by Permission. Courtesy of Sony Music Entertainment UK Limited. 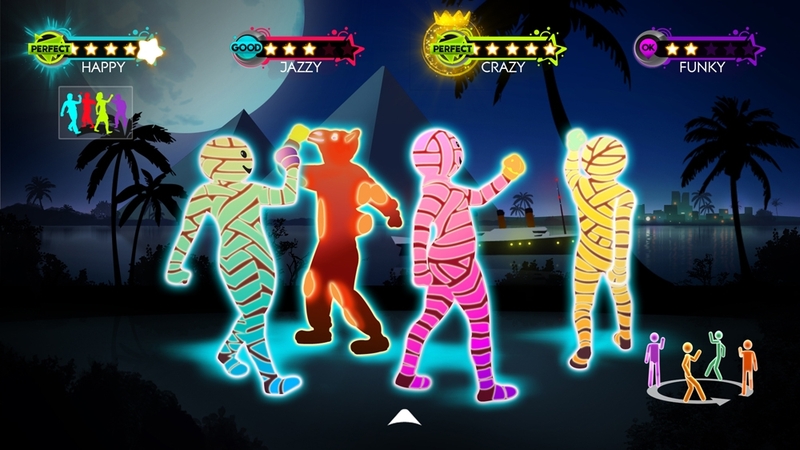 By arrangement with Sony Music Entertainment Canada Inc.
Get this creepy-cool mummy suit from Just Dance 3, that will keep you dancing into the afterlife! 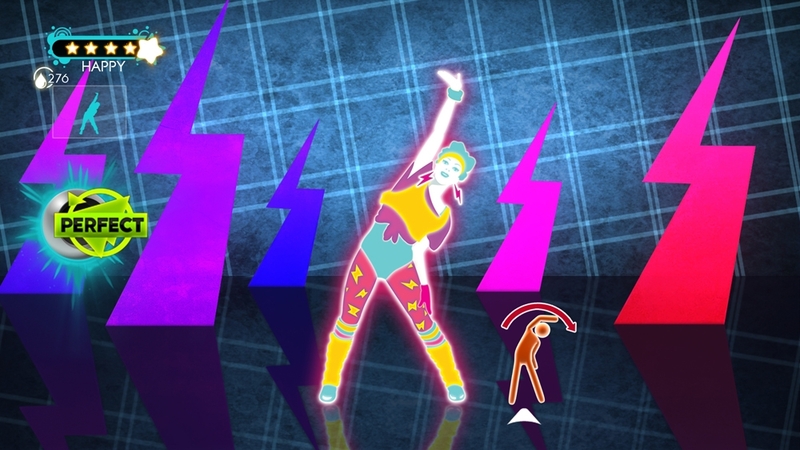 Don’t be afraid to lose control while dancing in this fabulous retro ‘80s outfit from Just Dance 3! 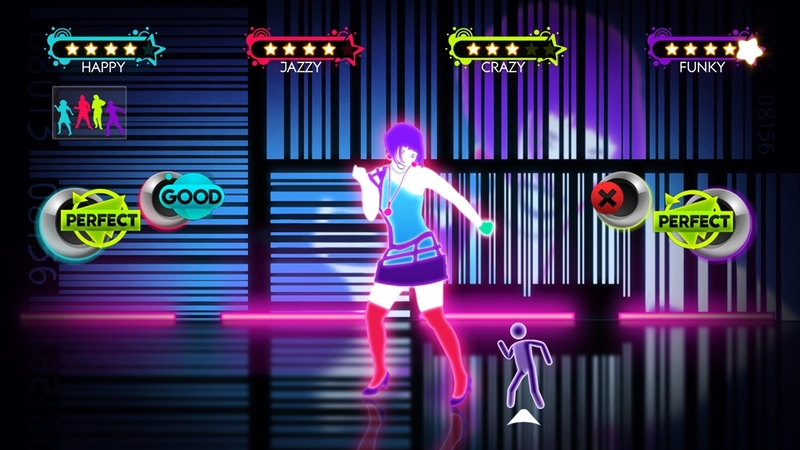 Make the other avatars jealous of this ultra-cool rockstar dance move from Just Dance 3! 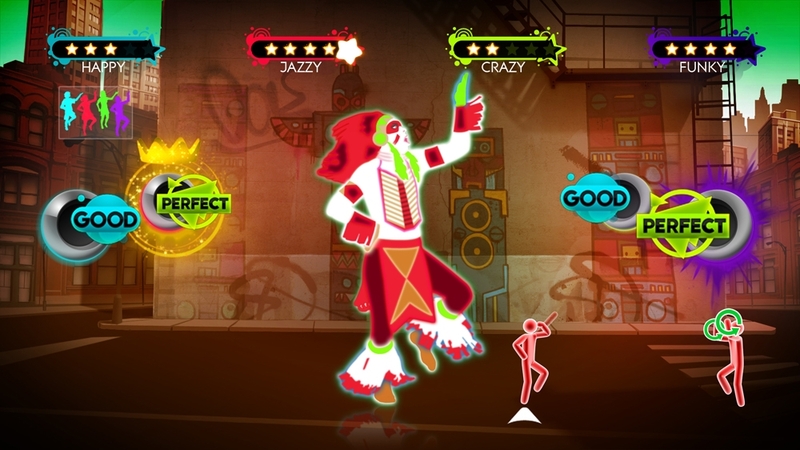 Boogie all night with this funky ‘70s get-up from Just Dance 3! 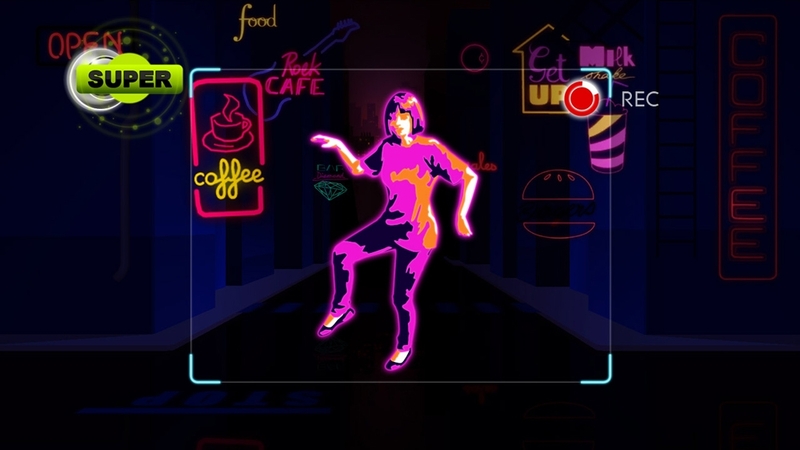 While you might not feel like dancing, your avatar certainly will with this outrageous dance move from Just Dance 3! Show off your worldly style with this suave number from Just Dance 3! The Sunlight Shakers (Music Downloads Not Rated by the ESRB) Join the movement and get the best dance music. Expand your track list to keep the dance party going! Download "Jump in the Line" - The Sunlight Shakers. Written by Raymond Bell, Ralph de Leon, Gabriel Oller and Steve Samuel. Published by Clara Music Publishing Corp. (ASCAP). Administered by Next Decade Entertainment, Inc. All rights reserved. Used by permission. Courtesy of Ubisoft Music. Jamiroquai (Music Downloads Not Rated by the ESRB) Join the movement and get the best dance music. Expand your track list to keep the dance party going! Download "Cosmic Girl" - Jamiroquai. "Cosmic Girl" Written by Jason Kay, Toby Smith, Stuart Zender,Derrick McKenzie, Wallis Buchanan and Simon Katz. Published by EMI (BMI). All rights reserved. Use by permission. Courtesy of Sony Music Ent. UK Limited. By arrangement with Sony Music Ent. 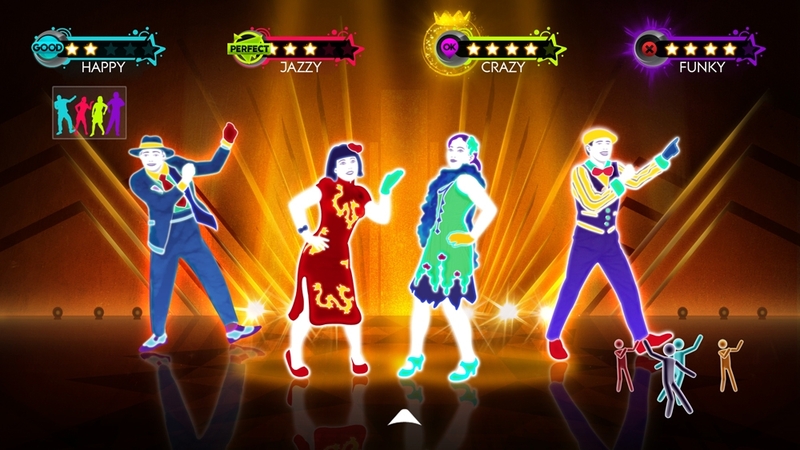 Canada Inc.
Just Dance 3 is America’s hottest dance game! Join the movement when you sport this highly danceable varsity jacket. You’ll instantly fall in love with this classic rock ‘n’ roll outfit from Just Dance 3! 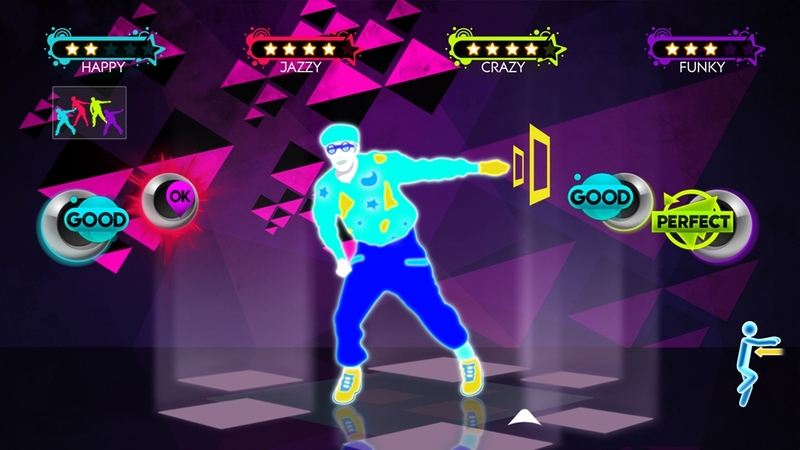 You can’t beat this classic ‘80s dance move from Just Dance 3! Benny Benassi (Music Downloads Not Rated by the ESRB) Join the movement and get the best dance music. Expand your track list to keep the dance party going! Download a free demo of "Satisfaction" - Benny Benassi. Benny Benassi presents "The Biz" - "Satisfaction (Isak Original Extended)" Written by A.Benassi. Published by Off Limits / Courtesy of d:vision records, a trademark of Energy Production Srl.